In the summer of 1942, a band of citizen soldiers were brought together by the desire to be better than the other guy. At its peak, Easy Company, 506th Parachute Infantry Regiment, 101st Airborne Division, U.S. Army, was as good a rifle company as any in the world. From their rigorous training in Georgia in 1942 through Utah Beach, Market-Garden, the Bulge, and Hitler's Eagle's Nest, WWII historian Stephen Ambrose tells the story of this remarkable company. In combat, the reward for a job well done is the next tough assignment, and the men of Easy Company kept getting the tough assignments, from parachuting into France early D-Day morning to capturing Hitler's Bavarian outpost. From the bestselling author of Undaunted Courage and D-Day, the definitive book on the most important day of World War II, comes the inspiring story of the ordinary men of the U.S. Army in northwest Europe from the day after D-Day until the end of the bitterrest days of the war. Citizen Soldiers opens at 0001 hours, June 7, 1944, on the Normandy beaches, and ends at 0245 hours, May 7, 1945. In between come the battles in the hedgerows of Normandy, the breakout at St.-Lô, the Falaise Gap, Patton tearing through France, the liberation of Paris, the attempt to leap the Rhine in Operation Market-Garden, the near-miraculous German recovery, the battles around Metz and in the Hurtgen Forest, the Battle of the Bulge -- the biggest battle in the history of the U.S. Army -- the capture of the bridge at Remagen, and finally the overrunning of Germany. From the high command (including Eisenhower, Bradley. and Patton) on down to the enlisted men, Stephen E. Ambrose draws on hundreds of interviews and oral histories from men on both sides who were there. Ambrose once again recreates the experiences of the individuals who fought the battles. The women who served as nurses, secretaries, clerks, code-breakers, and flyers are part of the narrative, as are the Germans who fought against us. Within the chronological story, there are chapters on medics, nurses, and doctors; on the quartermasters; on replacements; on what it was like to spend a night on the front lines; on sad sacks, cowards, and criminals; on Christmas 1944; on weapons of all kinds. Ambrose reveals the learning process of a great army -- how to cross rivers, how to fight in snow or hedgerows, how to fight in cities, how to coordinate air and ground campaigns, how to fight in winter and on the defensive, how citizens become soldiers in the best army in the world. Ambrose evokes the suffering of warfare, fighting in the cold and wet, gruesome wounds, combat exhaustion, looting, shooting prisoners, random destruction and more. Throughout, the perspective is that of the enlisted men and junior officers. Even when writing about Ike, Monty, Patton, and Bradley, Ambrose does so from the point of view of the men in the front lines and focuses on how the decisions of the brass affected them. Citizen Soldiers is a biography of the U.S. Army in the European Theater of Operations, June 7, 1944, to May 7, 1945. Allied citizen soldiers overcame their fear and inexperience, the mistakes of the high command, and the enemy to win the war. Once again, Stephen E. Ambrose shows that free men fight better than slaves, that the sons of democracy proved to be better soldiers than the sons of Nazi Germany. Stephen E. Ambrose draws from more than 1,400 interviews with American, British, Canadian, French, and German veterans to create the preeminent chronicle of the most important day in the twentieth century. Ambrose reveals how the original plans for the invasion were abandoned, and how ordinary soldiers and officers acted on their own initiative. D-Day is above all the epic story of men at the most demanding moment of their existence, when the horrors, complexities, and triumphs of life are laid bare. Ambrose portrays the faces of courage and heroism, fear and determination -- what Eisenhower called "the fury of an aroused democracy" -- that shaped the victory of the citizen soldiers whom Hitler had disparaged. Ambrose was born in Lovington, Illinois, and raised in Whitewater, Wisconsin, having graduated from Whitewater High School. His family also owned a farm in Lovington, Illinois, and vacation property in Marinette County, Wisconsin. Ambrose received his Ph.D. in 1960 from the University of Wisconsin-Madison. He served as a professor of history at several universities from 1960 until his retirement in 1995, having spent the bulk of his time at the University of New Orleans. For the academic year 1969-70, he was Ernest J. King Professor of Maritime History at the Naval War College. In 1970 while teaching at Kansas State University, Ambrose was asked to resign after having heckled President Nixon during a speech that the president gave on the KSU campus. He also taught at Louisiana State University in Baton Rouge and the Johns Hopkins University in Baltimore. Early in his career, Ambrose was mentored by World War II historian Forrest Pogue. He was the author of several bestselling books about the war, including D-Day, Citizen Soldiers and The Victors. Other major books include Undaunted Courage, about Lewis and Clark, and Nothing Like It in the World, about the construction of the Transcontinental Railroad. He was the founder of the Eisenhower Center and President of the National World War II Museum in New Orleans, Louisiana. He was the military adviser on the movie Saving Private Ryan and was an executive producer on the television mini-series that was based on his book, Band of Brothers. Former president and five-star general Dwight D. Eisenhower requested Ambrose as his biographer after admiring his work on Halleck: Lincoln's Chief of Staff, which was based on his doctoral dissertation. The resulting Eisenhower biographies were generally enthusiastic but contained many criticisms of the former commander in chief. Ambrose also wrote a highly regarded three-volume biography of Richard Nixon. Although Ambrose was a vehement critic of Nixon's, the biography was lauded as being fair and just regarding Nixon's presidency. However his Band of Brothers (1993) and D-Day (1994), about the lives and fates of individual soldiers in the World War II invasion, placed his works into mainstream American culture. The mini-series 'Band of Brothers' (2001) lionized American troops and helped sustain the fresh interest in WWII that was stimulated by the 50th anniversary of D-Day in 1994, and the 60th anniversary of D-Day in 2004. Ambrose has received criticism from American veterans. Veterans of troop carrier units that transported paratroopers in the American airborne landings in Normandy have severely criticized Ambrose for portraying them as unqualified and craven in several of his works, including Band of Brothers and D-Day, and for characterizing them as "cranks" when they asked that he change the passages. Mark Bando, a published historian of the 101st Airborne in World War II, maintains a Web site ("Trigger Time") that, while often praising Ambrose, also notes numerous discrepancies and some apparent fabrications, many of which have disturbed other veterans of the 101st. 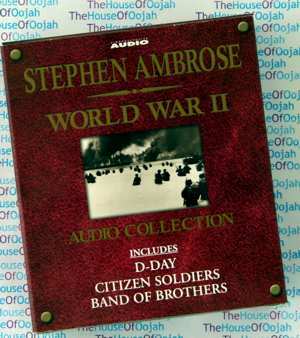 Ambrose also appeared as a historian in the landmark ITV television series detailing the history of World War II, The World at War. Ambrose, a longtime smoker, was diagnosed with lung cancer in April 2002. The condition deteriorated rapidly, and, seven months after the diagnosis, he died at the age of 66. He was survived by his wife, Moira, and children Andy, Barry, Hugh, Grace, and Stephenie. Later that year, Ambrose was posthumously awarded the Theodore Roosevelt Medal for Distinguished Public Service from the Theodore Roosevelt Association.